Last weekend The Lismore Clinic held its first Well-Being Open Day, with lots of information and talks about natural ways to help improve your mood and energy levels. The event was very well attended, and it was a really interesting and enjoyable day. One subject that people were very interested in was improving emotional wellbeing with nutrition. So in this week’s article we will look at some of the foods that can improve your mood and energy levels. Some of the most important nutrients for wellbeing are the omega 3 essential fats, particularly EPA, which is found predominantly in oily fish. The best source is mackerel, followed by herrings, sardines and tuna. Salmon and trout are also rich in this important nutrient. It is advisable for people to eat oily fish at least 3 times per week, and for those suffering from depression or low mood, a supplement containing 500-1000mg EPA per day is also recommended. Seeds such as Pumpkin and ground flax seeds (linseed) also contain omega 3 essential fats, but unfortunately only about 5% of the omega 3 fats in seed oils can be converted to EPA. Therefore, while seeds are a very useful source of protein and various minerals, flax seed oil is really not an ideal source of omega 3 essential fats. B vitamins reduce anxiety, depression and fatigue. They are found mainly in whole grains (such as oats), beans, lentils, nuts, and seeds. Vitamin B12 is predominantly found in animal foods such as meat, fish, eggs and dairy produce. To improve mood and energy levels, take a vitamin B complex supplement, which provides 25mg-50mg of B1, B2, B3, B5, and B6, and at least 100mcg of folic acid and 10mcg of B12 and biotin. Vitamin B supplements are best taken in the morning. Magnesium reduces anxiety and insomnia, and improves energy levels. It is found in nuts, seeds and chocolate, which is why people with magnesium deficiency often experience chocolate cravings. Raw cacao or good quality dark chocolate in moderation can help to boost magnesium levels. Alternatively, take 100-150g Magnesium citrate or Magnesium maleate (which are more readily absorbed that other forms of magnesium) two or three times daily. Tryptophan is an amino acid which is found in protein-rich foods such as beans, lentils, nuts, seeds, fish, eggs and meats (particularly turkey). Tryptophan is the precursor of seratonin, the happy hormone. Low seratonin levels cause depression, anxiety and sleep disturbance, and orthodox antidepressants work by increasing the activity of seratonin. However, increasing the amount of tryptophan in your diet can naturally boost your seratonin levels. Vitamin D, the sunshine vitamin, is essential for maintaining a positive mood and good energy levels. The best source of vitamin D is sunshine, but most people do not get enough sun exposure, either due to spending too much time indoors, or because of over-use of sun-block. To naturally increase your vitamin D levels, get some sensible sun exposure, without sun-block: 15-20 minutes per day with minimal clothing at around 11 am is ideal. Apply sun-block after 15-20 minutes to avoid burning if you plan on staying outside for longer. In next week’s article we will take a look at how what you eat and the way you eat might be contributing to low mood, anxiety and irritability, and what to do about it. January is well known as being the most depressing month of the year. Post-Christmas credit-card bills, failed new year’s resolutions, cold dark days, and long nights are bad news for emotional our well-being. In order to create a little light at the end of the tunnel, The Lismore Clinic will be holding its first annual “Well-Being Day” on Sunday 29th January from 2-5p.m. There will a number of useful talks throughout the afternoon including ‘Nutrition and Herbs for Emotional Well-Being’ by Medical Herbalist, AnneMarie Reilly, ‘Aromatherapy for Well-Being’ by Aromatherapist, Wendy Livingson, ‘Coping with Stress’ by Psychotherapist, Marianne Gurnee, and ‘Emotional Well-Being for Children’ by Art Therapist, Lorraine Shanahan. Other qualified and experienced practitioners will also be available for a free, no obligation, informal chat, and light refreshments will be available. Many people who suffer from the ‘January blues’ feel that it’s just not serious enough to do anything about it – feeling worn out and a bit low is hardly reason enough to take antidepressants or to go into therapy, but there are plenty of simple and natural ways to reduce stress, boost your mood and energy levels, and beat those January blues. For example, herbs such as St. John’s wort lift the mood and improve motivation, while others, such as Siberian ginseng help to improve energy levels and protect the body from the effects of stress. These herbs are not habit-forming, and are therefore suitable for short-term use if your January blues tend to evaporate with the arrival of spring. What you eat also has a big impact on your emotional as well as your physical well-being. It is important to eat plenty of warm, nourishing foods that benefit the nervous system at this time of year, such as oats, and to keep your blood sugar levels balanced throughout the day. Useful supplements for emotional well-being include vitamin B complex and essential fatty acids, both of which are necessary for a healthy nervous system. Aromatherapy is another very effective way of improving emotional well-being. The nostrils are also attached to a part of the brain called the limbic system, which controls emotions and influences the nervous system and hormone balance. When essential oil molecules are inhaled, messages are transmitted to the limbic system, which can either stimulate or relax the body and mind. For example, rosemary oil is uplifting and stimulating, while lavender oil is calming and relaxing. Messages from the limbic system also affect many body processes including heart rate, blood pressure, breathing, digestion, stress levels, memory and mood. While some people may feel that talking over their problems with a counsellor or psychotherapist may be helpful, others may feel that their problems don’t really justify exploring their emotions in great detail. For people who just need a little support to solve a problem or make decisions for the New Year, one or two counselling sessions is often enough to make a huge difference. Likewise, for people who can’t really put their problems into words, or for children and young people coping with the stress of school, Art Therapy can be a very useful way of expressing these emotions. Even where one to one therapy is not required, art can still be a very useful outlet if used in the right way. To find out more about these simple and natural ways to beat the January blues, why not come along to the The Lismore Clinic “Well-Being Day” on Sunday 29th January from 2-5p.m. This open day is completely free of charge, which is good news in these difficult times. The event will be of particular interest to anyone who would like to find out about natural ways to reduce stress and improve emotional well-being, but all are welcome. Cervical cancer is the second most common cancer in women under 45, both in Ireland and around the world. Around 180 Irish women are diagnosed with cervical cancer every year, and over 70 women die annually from the disease. Next week is Cervical Cancer Prevention Week, which aims to raise awareness about how to prevent this most serious and life-threatening disease. Cervical cancer is predominantly caused by a long-term infection of cervix by the Human Papillomavirus (HPV). HPV is transmitted by sexual contact, and therefore the risk of contracting it is increased by starting sexual activity at a young age, having multiple sexual partners, and not using barrier methods of contraception. Once it has been contracted, the HPV virus may lead to the development of abnormal cells on the cervix, a condition known as ‘cervical dysplasia’. In some cases, cervical dysplasia may lead to the development of cervical cancer. There is now a vaccine available in Ireland, which prevents infection from the two high-risk strains of HPV that cause over 70% of all cervical cancers. It is recommended that all girls should be vaccinated at around 12 years of age. However, it is important to be aware that the vaccines provide no protection against the other strains of HPV (which cause the remaining 30% of cases of cervical cancer), and vaccination offers no benefit to women who are already sexually active. Therefore it is still just as important for all women to continue having regular smear tests. There have also been a number of reports of serious adverse reactions to vaccine to date, and the long-term effects are unknown. The main symptoms of cervical cancer are abnormal bleeding and lower back-ache. 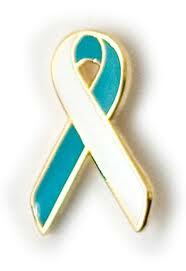 However, cervical cancer does not usually cause any signs or symptoms until the very late stages. Therefore cervical screening with regular smear tests is the only way to ensure that any abnormal cells are detected and treated early. Cervical screening involves taking a sample of cells from the cervix and examining them for any abnormalities. The National Cancer Screening Programme, CervicalCheck, provides free smear tests to women aged 25 to 60. Women under 45 should attend for screening every three years, and women over 45 should attend every five years. Women who have not had a smear test in over three years can register online at the CervicalCheck website, or by calling CervicalCheck on Freephone 1800 45 45 55. If the results of the smear test show abnormalities, the patient may be referred for a more detailed examination of the cervix (colposcopy), or for a biopsy of cervical tissue; but in many cases the patient is simply advised to return for another smear test every six to twelve months to monitor the changes. This is because cervical dysplasia does not always lead to cancer, and even where this does happen, it may take 10 years or more for cervical abnormalities to become malignant. Fortunately there are natural ways of helping to prevent cervical abnormalities from leading to cancer. First of all, it is important to stop smoking and to reduce the intake of red meat, fatty foods and sugar, all of which encourage the development of cancerous cells. Antioxidant nutrients such as vitamins A, C, E, and the minerals selenium and zinc play an important role in assisting the immune system to fight the virus, and preventing the development of cancerous cells. Foods which are rich in antioxidant nutrients include coloured fruits and vegetables (such as carrots, pumpkin, broccoli, raspberries and blueberries), and nuts and seeds (such as brazil nuts and pumpkin seeds). In last week’s article we looked at the pros and cons of detoxifying the body to help remove harmful substances and improve health. This week we will look at safe, gentle and effective ways to allow the body to cleanse itself from the inside out, without causing any unnecessary discomfort. The need to detox arises when the amount of harmful substances in the food we consume is greater than the ability of our bodies to remove them. The presence of excess toxins in the bloodstream can lead to fatigue, sluggishness, poor concentration, digestive disturbance, joint pain, skin problems, body odour and bad breath. All sorts of products and diet plans are available which claim to detoxify the body; however, many of these approaches are unproven, and some may even be harmful, leading to worsening of symptoms in the short term and nutritional deficiencies in the long term. Harsh detox diets, particularly those which only include raw foods or juices, are not ideal during the winter months as they can weaken the digestion, and therefore ironically increase the toxicity of the body. In order to detox effectively, the body needs to maintain a good strong digestion. This can be likened to a furnace, which needs to burn hot in order to effectively break down foods and kill microbes. Too many cold or raw foods eaten during the winter months can dampen the digestive fire and allow the proliferation of microbes in the gut, and the passage of improperly digested molecules into the bloodstream. It is therefore important to avoid very cold foods such as salads, yogurt, and refrigerated water at this time of year. Choose warm foods such as steamed vegetables, rice, and easy to digest pulses, such as red lentils and mung beans; and use herbs and spices which assist the digestion, such as cardamom, coriander, fennel and turmeric. The most important thing is to eat as much natural, unprocessed food as possible, particularly fruit and vegetables. A good detox breakfast is gluten-free rice porridge with steamed fruit and cinnamon. Most fruits are also fine to eat. However, avoid plums and rhubarb, which increase the levels of uric acid in the body. Kedgeree is another great detox dish, variations of which can be eaten for lunch and dinner. 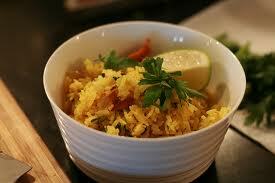 It is made by cooking easy to digest basmati rice with red lentils or soaked mung beans in water for about 40 minutes. Use spices such as cardamom, coriander, cumin fennel and turmeric to aid digestion and add flavour, and add vegetables in any combination, All vegetables can be eaten in unlimited amounts except those of the nightshade family (potapes, peppers, aubergines, tomatoes). Also avoid mushrooms, and any vegetable that disagrees with you (cabbage, cucumber and onions are common culprits). By ensuring the digestion is functioning effectively, and by simply avoiding the main causes of toxicity in the body (such as packaged or processed foods, fried foods, red meat, dairy products, sugar, wheat, caffeine, and alcohol) the body’s own detox systems will naturally start to remove toxins from the body. However, herbs which support the major organs of elimination include dandelion root, milk thistle, and chicory for the liver; and nettle, cleavers and celery seed for the kidneys. Unfortunately, excluding refined sugar and caffeine always runs the risk of withdrawal symptoms and even the gentlest detox plans can cause unpleasant effects such as headaches, fatigue and skin breakouts as the toxins are eliminated from the body. However, these symptoms should be mild and pass within a few days; and the benefits you will feel afterwards will definitely make it all worthwhile! After all the excesses of Christmas, many people are thinking about a detox to cleanse their systems of all that stodgy food and alcohol. In some ways, the start of a new year is a great time to overhaul your diet, but the middle of winter is far from the ideal time for most types of detox diet. So why has detoxing become so popular, and what is the best way to go about it? Many of the foods we eat, such as processed food, meat, non-organic fruit and vegetables, caffeine and alcoholic drinks, contain substances which are harmful to our bodies. Some of these substances are naturally occurring, such as hormones in meat, while others are due to the use of chemicals such as pesticides, preservatives or artificial colours or flavouring. In some cases the harmful substances may be produced inside the body as a result of metabolism, or they may be due to substances entering the bloodstream which have not been fully broken down during digestion. In any case, these substances must be removed from the bloodstream by the liver or kidneys, and eliminated from the body through the bowel or the urinary system. If the amount of toxins consumed is low, the liver and kidneys will be able to cope with this task and the body remains healthy. However if the consumption of toxins exceeds the ability of the body to remove them (as is most frequently the case these days) a number of symptoms can arise. First of all, the presence of excess toxins in the bloodstream can lead to symptoms such as fatigue, sluggishness, digestive disturbance and poor concentration. Excess toxins, particularly uric acid, may be sequestered in the joints, leading to inflammation, pain and stiffness. In an attempt to restore health, the body tries to eliminate the toxins from the body in other ways: toxins can be pushed out through the skin, which serves as a third organ of elimination. This can lead to symptoms such as body odour, itching, dryness of the skin, and spots or rashes. Toxins can also be pushed out through the lungs, causing bad breath. Alongside the weight-loss industry, the whole area of detox has become big business, with all sorts of techniques ranging from colonic hydrotherapy, to body soaks and masks which aim to draw toxins out through the skin. All sorts of products are on sale which claim to detoxify the body, and diet plans are available which last from a few days to several weeks, and include complete fasting, liquid or juice only diets, the raw food diet, even the Hallelujah diet! However, many of these approaches are unproven, and some may even be harmful. Diets with too many restrictions can lead to nutritional deficiencies in some individuals if they are adhered to for long periods of time. They are often not suitable for people who are weak or otherwise unwell, and can sometimes lead to worsening of symptoms in the short term. Harsh detox diets, particularly those which only include raw foods or juices, are not ideal during the winter months as they can weaken the digestion, and therefore ironically increase the toxicity of the body. In next weeks article we will look at a manageable detox plan, which will safely and gently allow the body to cleanse itself from the inside out, without compromising your health or causing any unnecessary discomfort.